With my new lab starting in Fall 2018, I am now interested in prospective graduate students and postdocs. More information on how to apply here. Below are some of my thoughts and advice on applying to graduate schools and being a graduate student. Rather than basing your decision on the prestige of the school, choose a good lab (research group led by a PI). The best schools tend to have better labs but not always, and the most prestigious schools might have a more competitive atmosphere, which may or may not be your thing. Schools can specialize by hiring several excellent faculty in a specific area, such as animal behavior. For example, University of Texas Austin and University of California Davis have two of the best animal behavior programs in the world, despite not being as famous as Harvard or Oxford. The name of the school does matters and so do the other labs in your department, but for a research career in our field, what matters most is the quality of your papers not the prestige of the school. So the question should be: which lab will help me do my best possible work? A good place to see a bunch of labs at once is to go to a scientific conference. Don’t be afraid to ask a senior grad student or postdoc: If you were me, what lab would you join? Don’t apply to the school until you’ve talked with the PI. Also, talk to at least three people in the lab and ask them what the PI is like. Are they hands-off or demanding? What are lab meetings like? How quickly do they respond to emails? Ask them in a way and in a setting where they can be totally honest. Expect to hear different things, but look for common themes. The PI matters a lot, but so do the other lab members. You’ll probably spend more time with them than the PI. So try and evaluate about the culture of the lab. If the PI has a very large lab, see if there’s a postdoc that could be your direct mentor. In some countries and at some schools, getting a masters before a doctorate is mandatory, and I think there’s actually some sense in this. But many undergraduates in the USA who want to do a PhD in biology think getting a masters in biology does not make sense and is a waste of time. I’d like to present the counter-argument. There are two good reasons to get a masters before a PhD. First, doing a masters puts you one step ahead when you start your PhD. Becoming a good scientist typically takes a long time. Many students think that a masters degree puts you two years “behind” but it actually puts you two years ahead, because a masters is like a “practice PhD”. You’ll get better at critical reading, writing, and statistical analysis. If all goes well, you publish a paper, maybe even two. When you start your PhD, you’ll be a better researcher than you would have been coming straight from your undergrad. A 2-year MSc degree can even put you on track to get your PhD two years earlier, or get you a faculty interviews as postdoc two years earlier. One secret to success in academia is trying to be one step ahead of where you need to be at each stage of your career. As an undergrad, that means publishing a paper. As a starting PhD student, it means having a compelling proposal to apply for fellowships. As a finishing PhD student, it means establishing yourself as an international expert on the topic of your dissertation. As a postdoc, it means laying the foundations for a fundable long-term research program. At each stage, you will not be compared to others based on your age. So while impressive, there’s no real long-term advantage of being a 24-year-old with a PhD. Instead, you’ll be competing for funds with others at the same career stage, based on what you’ve done so far. My point is that what you know, and what you’ve done, are more important than how quickly you get various degrees. Second, doing a masters gives you time to decide if academia is right for you. Being a research scientist in a field like behavioral ecology is one of the most creative and intellectually stimulating jobs one can imagine. If I had a million dollars, almost nothing about my work life would change. But science is truly a “labor of love”, and academia is neither the fastest nor easiest path to securing a permanent, stable job. For instance, 12% of college baseball players go on to play in the major leagues, whereas only 10% of incoming biology PhD students become biology professors. As an undergrad, you can get a pretty rosy picture of academia talking with professors. There’s survivorship bias: the people who tell you about academia as a career are the few people who succeeded in it through some combination of talent, perseverance, and luck. Professors are not a random sample of grad students; whereas many grad students suffer through graduate school, many professors look back at their grad school years with sweet nostalgic memories of having the time to focus solely on their research. It’s easy for professors (especially older professors) to think, “I simply did X, Y, and Z and that’s how I became a professor”, but today, the statistics for becoming a professor are actually a bit grim. Each year in the USA, there are 16,000 new biology PhD students. Of those successful recruits, 63% get their PhD, and the average time to that degree is 7 years. 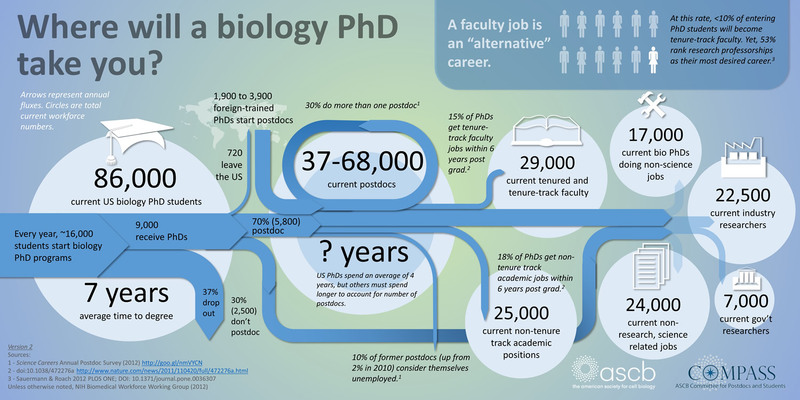 Of those graduates, 70% get a postdoc and of those postdocs, 30% get a second one. Only 15% of postdocs get a tenure-track job within 6 years (~13 years after receiving a PhD). Most starting PhD students in biology in the USA want to be a tenure-track professor. But only about 7% of them actually get that job. If you’re unsure about doing a PhD, just ask yourself this question: if you knew you had a zero chance of getting a faculty job, would you still want to spend 7 years doing a PhD just for the experience itself? If the answer (as it would be for many of us) is: “Yes! I love doing research“, then of course do a PhD! You cannot lose. If you’re unsure, then perhaps consider a masters instead. Then, you’ll be in a better position to know whether to commit to the longer academic journey, complete with greater expectations, fewer deadlines to structure your time, and an extra dose of imposter syndrome. Some starting grad students realize that they don’t want to be in academia in the middle of their PhD, but it’s difficult psychologically to quit and do something else that makes you happier. That transition can feel like failure. In contrast, you can always turn a MSc into a PhD, and if you start with the goal of getting a masters, you can leave with a masters and that is a great success. It’s a way to test the waters. Brainstorm a list of topics and questions that are truly interesting to you. Study the most fascinating topic you can. Read the literature, but don’t let the literature tell you what questions are interesting. That is, don’t get brainwashed by other people’s research agendas: it’s good to think outside the box. Start with a compelling question, then think about how someone could get the answer, then look to see if anyone has done exactly that. Many big interesting questions are addressed by one or more general theories and every theory makes key assumptions and predictions. Have these actually been tested yet? That’s a good place to start. For example, biological market theory assumes that a shift in supply or demand will lead to changes in the value of services exchanged by individuals in a mutualism. Has this been tested? Reciprocity theory predicts that individuals will reduce cooperative investments towards individuals that don’t reciprocate. What’s the evidence for that? Not every interesting phenomenon is directly addressed by a scientific theory, but often there is a theory, perhaps from another discipline, that could be applied to the problem. That’s another good starting place. For example, what theories from biology could be explain the psychology of human friendship? If your research doesn’t address a theory, it should address a big question that is of interest to many people. What’s been done before? Show that you know the background work. Show that you know what studies are relevant and which aren’t. What’s the problem with the current state of knowledge or the current paradigm and the evidence for it? What’s missing? Show you can think critically. What needs to be done to fix that problem? What could be done by you in just the next few years? Show that you can set realistic goals. If [hypothesis], then [prediction]. Show that you can think logically and clearly. What resources do you need to accomplish this? If applying somewhere: Why is location X a good place to get those resources? Why is person X the best person to help you? Demonstrate that you know the person or lab. Why can we be sure that you will finish the task? After you write the draft, get lots of feedback. Get input from as many minds as possible. The most likely scenario is that inexperienced researchers will propose to do ambitious things X, Y, and Z in their first year, and more experienced people will tell them to start off by focusing just on part 1 of X. Just doing that might take 2 years. Scientists don’t receive any training in how to be a good mentor. Your PI will be committed to your success but they won’t necessarily know what you want or need unless you tell them. Nobody wants to be “needy” but it’s a good idea to be proactive. If the PI doesn’t check up on you, send them monthly updates. When you write outlines and drafts, ask for feedback. If you want to discuss things, ask them when is good to meet. Professors have packed schedules, so it’s usually better to set a meeting, then to just drop in and expect to have a long discussion. Being a successful academic is not always the same thing as being a good scientist. There are academics who are terrible scientists, and there are great scientists who are not very successful in academia. Being a successful academic means being a good teacher, getting large grants, and publishing in prestigious journals. In sum, it means that you have lots of influence in your field. Being a successful scientist, however, means that your influence is actually moving your field towards a more accurate view of the world, because your work is careful and rigorous, you encourage other people to critique it, and you are honest about the limits of your conclusions. In sum, you say things that are actually true. Science is a job for people who value intellectual honesty, skepticism, logic, and evidence. Science is inherently open and transparent. If you try to succeed in academia at the expense of the quality of your science by overselling your work or making straw man arguments, you may do well in the short-term, but you will eventually gain a bad reputation as a sloppy scientist among the leading researchers in your field. And those are the people you should care the most about impressing. Ideally, we are both good scientists and good academics. The ideal lab has a culture that encourages being a good scientist first and foremost, by trying to create an environment where everyone feels safe to be ignorant and ask really naïve questions; where undergraduates feel comfortable arguing with the PIs, postdocs, and grad students; and where nobody criticizes people, but we all feel comfortable criticizing ideas (constructively). Not taking criticism of ideas personally or defensively is one of the one most difficult, yet important, skills for scientists. We must remember that the goal is to make the final product as good as possible, not to be the most expert or clever person in the room. Likewise, our goal should be to produce work that is transparently valuable, not to “get it past the reviewers”. Even if criticism is not constructive or just plain wrong, it still tells you what parts of your argument you may need to communicate more clearly. Expertise only comes from failing, a lot. The whole point of academia is meeting and talking with talented, interesting, and passionate people who know a lot about something, so do not be afraid to seek out, talk to, and listen to more experienced people who can think more clearly than you about topics with which you’re struggling. Yes, more senior scientists always seem too busy, but there is nothing they love more than to use their arcane knowledge to really help out a scientist in training. Looking back, I realize I wasted so many opportunities to talk science with really smart and knowledgeable people. Yes it can be embarrassing to reveal just how little you really understand about a topic, but everyone expects that from a student, so now is the best time! This entry was posted in About science as an activity, News. Bookmark the permalink.